Although doubts have been voiced about the origins of snooker, it is generally accepted that the game came into being in India in 1875. Billiards is a far older game with an even more clouded history, but Louis X1 of France is recorded as having a fledgling billiard table in the 15th Century. The word ‘billiard’ is believed to be derived from ‘ball’ words such as pila (Latin), billa (Medieval Latin) and bille (French), as well as ‘stick’ words like bille (Old French), billette (French) and billart (Old French). Shakespeare was one of the first recorded users of the word in his line: "Let’s to billiards, come Charmian," in Anthony and Cleopatra (act 11, sceneV). Other early writers who refer to billiards are Ben Johnson in his simile: "smooth as a billiard ball" in 1637, and Charles Cotton in his book The Compleat Gamester of 1674. 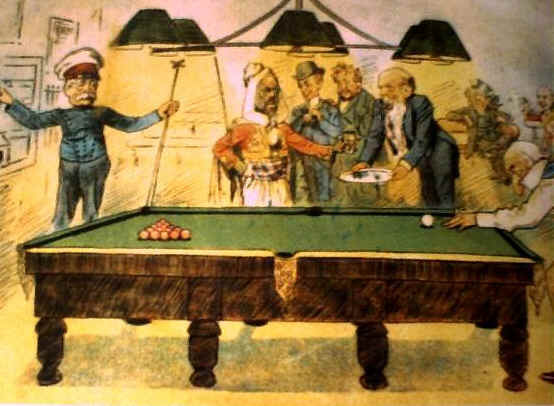 Billiards reputedly began life as a lawn game similar to croquet before being brought indoors and onto a table by the aristocracy. At first two balls were pushed with a mace, a stick flattened and curved at one end, but in around 1670 players began to use the thin end of the mace more often. By about 1800, the transformation from mace to cue was complete.